Fantasy football is a game of knowledge, skill and finesse. One must out think their opponent when setting lineups, be skillful in trade and weave the waiver wire carefully. Do that, and the chances of winning increase dramatically. Unless of course it’s Week 1. Then it becomes more of a “whose team is less crap” game. Here’s the proof. It does not help when an unexpected schedule change impacts your players, such as the predicament I fell into this week. Jameis Winston became unavailable, and I was sent scrambling. Using Winston’s long-term potential as bait, I went into the trade market for a start-worthy quarterback that would be on someone’s bench. Then, I found my guy, a guy that I was quite high on in this column last week, Carson Palmer. However, that plan backfired. As Fox turned to bonus coverage of the Cardinals-Lions game, Palmer threw his third interception of the day. I proceeded to bury my head in my shirt as my roommate, and this week’s opponent, broke out laughing. To make it worse, a certain 30-point quarterback was sitting on my bench. Despite a modest eight points for Palmer, I had the last laugh and got the ‘W’ in a week that was just crazy. Defenses reigned supreme, and top players failed to perform. But now, it is time for Week 2 and all the terribleness that comes with it. Remember when the Patriots gave up huge numbers in Week 1? Alex Smith owners do. However, those owners are only in 28 percent of ESPN leagues. Smith and his huge 30-point haul were started in just 13 percent. The Chiefs were known for a more conservative passing game last year. If the New England game is any indication, Kansas City can go big. The long-term outlook for Smith is good with a weak schedule, but a visit by Philadelphia is a tough ask this week. 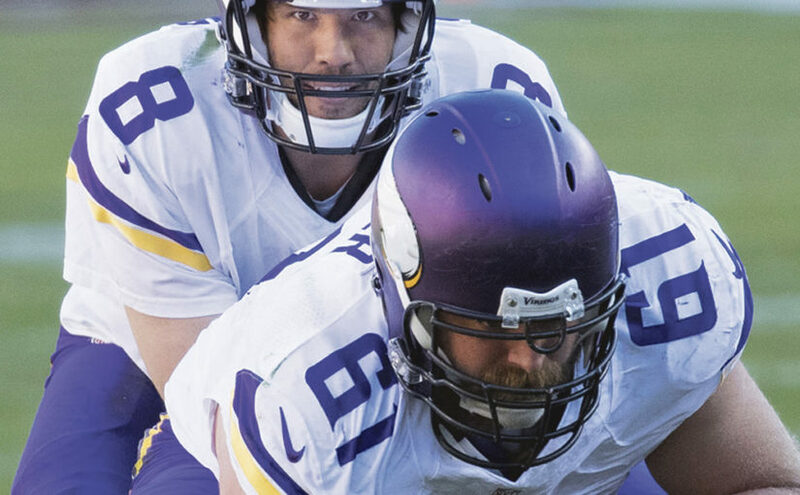 Sam Bradford is very good at throwing in the dink-and-dunk game. His NFL-record 71.6 percent completion rate last year indicated that. But how about completing 80 percent while having eight 20-plus yard plays? Sure, the Saints defense was in shambles, but it wasn’t a bad start. Start Bradford with caution as the Vikings go to Pittsburgh this week. Other notes: Surely Carson Palmer can’t be that bad, can he? At least plays a helpless Colts defense that gave up 46 points to the Rams. The Cowboys gassed the Giants defense last week, and now Matthew Stafford gets his licks. Thirty-nine points is unsustainable. Despite that fact, Kareem Hunt is the early candidate for fantasy breakout player of the year. There is nothing that would say he will stop putting up solid numbers. He worked well in the passing game as well as the rushing. With Spencer Ware on IR and Charcandrick West not looking like a threat, it’s all Hunt. Chiefs still have a tough game against Philadelphia this week. In the back end of last season, I considered Ty Montgomery as the ultimate flex play. The wide receiver turned running back did pretty much everything. After an offseason to complete the transition, he picked up right where he left off. In a game where offenses struggled to do anything, he became the catalyst for the Packers offense, playing 90 percent of snaps. At that rate, he will be worn down by the end of the season, but is still a good play at Atlanta this week. Other notes: David Johnson is reportedly out for two to three months, so expect a committee led by Kerwynn Williams to take over. Tarik Cohen may be the best handcuff in the league, playing in the pass catching role behind Jordan Howard in Chicago. When Carson Wentz did Carson Wentz things against the Redskin’s pass rush and fired down field, who thought that Nelson Agholor would actually catch the ball? Agholor really struggled with drops last year, but he had six catches last week. If he continues to have glue on his gloves, expect big things from him as Alshon Jeffery takes the top corners away. The Los Angeles Rams may have a team this year. Jared Goff looked sharp and so did Cooper Kupp. Kupp had four receptions and a touchdown in his debut against Indianapolis. Kupp will be a more secure Agholor to Sammy Watkins’ Jeffery. If Watkins draws the attention of Josh Norman this week, Kupp will go off. Other notes: Any team in the NFC South can find themselves in a shootout in any week. Green Bay visits the new Mercedes-Benz Stadium in Atlanta, and all parties involved in the passing game can figure to have big games. Usually, this is where a tight end would get the spotlight. Here’s the thing: defenses were way more effective last week. In fact, seven defenses led their teams in fantasy scoring last week. That is second most for any position group, only beaten by quarterbacks. In fact, four defenses — Rams, Jaguars, Eagles and Ravens — ranked in the top 10 of all fantasy performers. If forced to pick one out of that list for this week, it would be the Rams. At home to face a Washington Redskins offense that struggled to get clicking last week, not a bad play. The Ravens meanwhile host Cleveland, but DeShone Kizer looked decent in his debut, and could trounce Baltimore.